Ananka's Diary: Monster Quest Finally Found Something! Anyways, I have a friend in Canada, should I ask him about this? Seriously? They never find anything. Awesome! Did they find the little old man sitting on it's neck? Kitty--NJ is FILLED with oddness. You should check out the magazine Weird New Jersey--it's cheap and filled with local folklore, ghost stories, pictures of abandoned buildings and strange roadside attractions. kidnapping a possible monster seems like a REALLY dumb thing to do. Its probably Nessie's little cousin, and she's gonna come destroy them to get it back. Excellent! awesome!!! when my family went to Kelowna for summer break, at our hotel there were ogopogo tours and look out binoculars/stations on every floor. Rumour has it, that ogopogo is a cross between an earwig, and an orca whale... HmmmM....????? 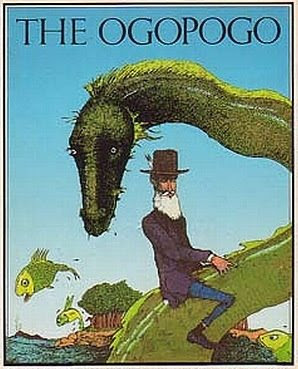 I can honestly say I've never heard of an ogopogo. Loch Ness monster, yes (who hasn't heard of Nessie? ), but never an ogopogo. It has a weird name. WHAT ABOUT WISCONSIN!!! ALL YOU HEAR ABOUT IS BEER, SNOW, FARMLAND AND CHEESE, AND NOTHING ELSE!!!! What about Champ, the supposed monster of Lake Champlain? There's a lot of controversy about it. too bad it was just a salmon! They got their DNA sample back and it was linked to a type of Salmon that had deteriated so much it was unrecognizable. Once again, MonsterQuest has come up empty handed!!!! any new updates on this find?